My colleague Stephen Ermann in Singapore made an amazing discovery this afternoon – we now can draw filled maps for Australian postcodes directly out of the box! This is a huge improvement for users in AUS as this has been one of the most requested mapping features. I’m also advised that we can look forward to further enhancements in this area so stay tuned. I’ve heard of this being possible and it’s REALLY exciting, but for some reason I don’t think I have the option! Also I noticed that Local Government Area (LGA) boundaries are available if you select ‘US County’ on the map options window. Hi Derek. I’ve had a couple of people report that they can’t get the filled maps to appear. Do you have any custom geocoding roles installed? If so, try uninstalling them (Map -> Geocoding -> Remove Custom Geocoding) and see if the filled maps work for you. Thanks heaps for your quick response! It turns out it wasn’t working half because I had custom geocoding installed, as you suspected, and half because I hadn’t yet upgraded to version 8.2.1 – I thought 8.2.0 had the feature, but it didn’t. I also really like how PO Box and other non-area postcodes, like 3001, appear as dots on the map alongside the areas. The My Tableau Repository directory is preserved between installations of Tableau – so if you had imported your custom roles prior to Tableau 8.2.1 then you had a copy of the old data without the new boundary information. When you remove the roles you pick up the new file and the filled maps suddenly appear. This would also explain why I could see the filled maps but also had custom roles imported – because I had imported them in 8.2.1. Let me know if you find something that contradicts this thinking. It would be great if you could share some insights on this. I have got Country(Australia), State, Postcode in my data but when I try to replicate what you have done on my workbook due to some reasons it doesn’t come with the filled map(insteada dotted map) and also why do you have latitude and longitude on filter shelf? 1) that you are running Tableau 8.2.1 or later. The postcode boundaries are not included in earlier versions. 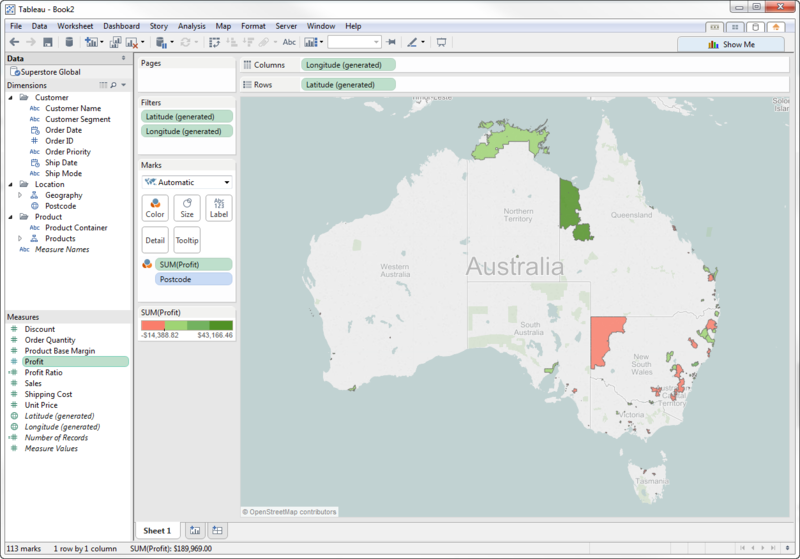 2) that you have removed any custom geocoding you might have imported in an earlier version of Tableau. Go to Map menu -> Geocoding -> Remove Custom Geocoding. If you address those two points then you should be able to plot a map with filled postcode regions simply by double-clicking on your postcode field (assuming it has the postcode geographic role associated) and setting the mark type to “filled map”. PS. My screenshot has lat/lon on the filter shelf because I have excluded some values from the viz. Top stuff you’ve found, but I’m having an issue with Tableau not properly recognizing my postcodes. I’ve confirmed the Postcode field in my data set is automatically associated with the ‘ZIP Code/Postcode’ Geographic Role. For some reason, I think Tableau is converting the 4-digit AUS post codes in my data set to 5 digits, all with a leading zero. I believe that is preventing Tableau to associate the postcode values in my data set with the AUS postcodes used for mapping. I’ve confirmed that Tableau is doing this; opening the ‘Describe’ dialog box by right-clicking on my Postcode field dimension shows that the members in my data set all have a leading zero. Frustrating! Two comments on the same day, both with the same symptoms. How peculiar! Have you checked that the locale for your workbook is set correctly to English (AUS)? Having it treat the number as 5 digits makes me think it might be trying to interpret as a US postal code. You can also check if you click on the “unknown marks” indicator at the bottom right of the map – make sure the country code is set to Australia. If your problem persists the most expedient solution will be to open a support ticket with our help desk. Simply email support@tableausoftware.com with a description of the problem and one of our engineers will help you. You could also try setting the default number format for the postcode field – right click on the field then Default Properties -> Number Format… Try setting it to “automatic” and if that doesn’t work set it explicitly to 0000. Thanks for the quick response! I had fixed it in the previous workbook by converting the datatype to string, but when I opened a new dataset to fix it I didn’t have any such problem (other than having to go to Map > Edit Locations to get Australia to show up). But if I run into this issue again I will let you know if the above fixes work as well.